With a mom who’s a school librarian, how could Kai and Kiki Wilson not love books? Well, it’s not as if their mom Heather Wilson had to drag them kicking and screaming. I interviewed the girls, 9 and 7, last week about their YouTube channel, Follow the Readers, where they review their literary picks and pans. In our Features story Sunday, find out how the girls got their start … and their reading recommendations. To find the Wilsons on YouTube, search Follow the Readers, and on Facebook, see https://www.facebook.com/followthereadersbookclub. Their blog is at http://followthereaders.com/. Like gluttons at an all-you-can-eat buffet, book lovers are helping the Port Orchard Library clear its shelves before construction begins Aug. 31 on a major renovation. The library will be closed until Oct. 21, as contractors install new carpet, make major repairs and upgrades, and construct a new layout designed for patrons’ increased comfort and convenience. Since early August, librarians have been pushing a “Checkout to Help Out” initiative, encouraging people to take up to 75 titles, preferably nonfiction. The books won’t be due until Nov. 2, so you’ll have more time to enjoy your stockpile. Now there’s an invitation to procrastinate. The actual limit is 100, but the library suggests 75, so patrons have leeway to check out other titles from the library’s system. Patrons are encouraged to choose nonfiction and mystery books, because those are the sections that will be most heavily impacted by the construction. According to librarian Susan Lee, the books are practically flying off the shelves. One man recently checked out 95. Someone traveling to Ireland swept clean the section on that country. Crafting books are disappearing; biographies are starting to thin out. “New arrivals,” the library’s equivalent of the impulse aisle by the grocery checkout counter, are picked nearly clean. “You can see we have a big gap,” said Lee, pointing, here and there and over yonder. Lee says this is a great opportunity for teachers to sweep up a temporary collection, as one teacher did with mythology books. So, here are a few things to know. * The last day of the free-for-all is Aug. 30. 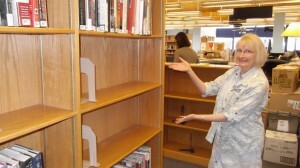 * From now until the end of construction, you can’t pick up holds at the Port Orchard Library. You can get them at Manchester (or any other branch in the Kitsap Regional Library system). * You are encouraged to hang onto all the Port Orchard books until the Nov. 2 due date. If you do need to return them, use the Sylvan Way branch in East Bremerton. * No, the Port Orchard librarians won’t be sipping Mai Tais on some foreign beach during the project. They will be working at other library locations throughout the system, and then putting the library back together before the reopening. * The cost of the project, $100,000, is covered by roughly $70,000 from Kitsap Regional Library’s capital budget. The Kitsap Regional Library Foundation will provide up to $10,000, and the Port Orchard Friends of the Library will donate roughly $30,000. The group has received significant donations from South Kitsap Rotary, Kitsap Bank, The Fred Meyer Foundation, The Phil Grey Foundation, Rotary District 5020 and numerous patrons who have donated for the renovation. I’m tardy in getting this up on the blog, but today only Kitsap Regional Library will allow patrons to return overdue books and other materials without charging a fine. The book amnesty day is in honor of the Bainbridge Public Library’s 50th anniversary. The library will be doing a major computer upgrade in April that will have many advantages for users and staff. In part, said Brody, KRL wants to have its records as clean as possible when the new system goes into action, and eliminating overdue fee notices will help. I’ll have a story on the “integrated library system” in early April. In honor of the Bainbridge Public Library Building’s 50th Anniversary, all branches of Kitsap Regional Library will offer forgiveness on overdue fines for items returned on Saturday, March 17. Overdue fines will be waived for any item returned to a KRL branch or the bookmobile that day. Outstanding fines for items returned earlier, fees for lost items or fees assessed on items that have been referred to a collection agency will not be waived. Because KRL sets $5 as the maximum overdue fine, the maximum savings possible to a library patron would be $5 per item returned. The goal of the amnesty day is to encourage the return of overdue library materials. Generally speaking, KRL would rather have overdue items returned than have to collect a replacement fee and buy a new item. In addition to helping the entire system celebrate the Bainbridge Library anniversary, it will also help KRL remove overdue fines from patron accounts prior to transferring our user records to the new Integrated Library System software that will go live April 26. KRL encourages patrons who have overdue items from the library to search your house for missing library books, magazines, DVDs or CDs so you can bring them in on March 17. Wednesday night architect Steve Rice unveiled his vision for a new library in Silverdale. At the request of the Kitsap Regional Library, Rice has been working for two years on a design for a new library. First he was tasked with creating concept for a library around 17,000 square feet (roughly the same size as the Sylvan Way library). That’s back when KRL asked voters to approve a levy increase that would in part help pay for the construction of new libraries in Silverdale and Kingston. When that measure failed, the library board went back to the drawing board for how it could expand the current Silverdale facility, which has been a desire of the library system and the community since 1998. Ultimately the board agreed to enter into an agreement with the county that would include hiring a consultant to conduct a feasibility study. (See my story from Dec. 12 for more details on the agreement). The purpose of the study will be to gauge how much the community is willing to contribute to a capital campaign to build a new library in Silverdale. It will also survey the constituency to determine whether people support building a new library, or if they’d rather see KRL move into a larger, existing space in Silverdale. While I’ve reported it repeatedly, it seems some people still think to build this library KRL will be increasing taxes. KRL will not ask for a levy increase, or increase taxes to build a new Silverdale library. However much the community says it’s willing to donate to the cause will be what KRL uses to fund its expansion. (The model will be similar to the one used to build the Haselwood Family YMCA — $12 million in public donations was raised to help build the facility). If the community determines it would prefer to see a new facility built, KRL board members have said they’d like to see the facility built on the Central Kitsap Community Campus, where the YMCA currently stands. The Y was the first phase of the campus. The second phase will be the addition of a new library (assuming that’s what the community wants) and potentially the addition of a performing arts center. Previously there was talk that a new library would be located where the Silverdale Community Center now stands. The idea was the building would be built into the hill — the community center would be torn down to make room. But during Wednesday’s presentation, Rice offered a new location for the proposed building. At 8,000 to 10,000 square feet, Rice envisions the new library to again be built into the hill, but this time located in the southwest southeast corner of the campus site, directly across the grassy area from the YMCA. Here’s a couple architectural drawings from his presentation. The first depiction shows a side view of the library, facing southwest, featuring the main entrance to the library on street level to the left, the view of a proposed gallery space and the entrance from the grass area — or village commons — to the right. While the building is proposed to be one story, there is an upper floor space for a community meeting room with views over Silverdale Way toward Dyes Inlet. The second depiction shows the view looking from the second floor of the YMCA above the front door looking down the village commons toward the library. The entrance to the library from the commons is visible, and so is the back of the library, which Rice proposed would offer a presentation space facing the commons. As I reported in my story, Rice proposed making the village commons/grass area more appealing to the public by adding walkway features, rose gardens and an outdoor amphitheater space that would be attached to the library building. One of the big questions about this location though is parking. The building would eliminate 24 parking spaces to fit into the campus design, and wouldn’t add any parking. It wasn’t financially feasible to add an underground parking garage, Rice said. Already parking is often filled on the campus site because of the heavy use of the YMCA, and many people at Wednesday’s meeting questioned how the site could handle more use with library patrons. County Commissioner Josh Brown said eventually a parking garage would have to be added to the 12-acre site, which has been the intention all along. The question is, who will be responsible for building (and paying) for it? If the library locates on the campus a study will be done to determine the library’s peak hours and the YMCA’s peak hours. Programs would then be planned around those peak times, to try and minimize the parking problems, Brown said. Obviously parking will be a big issue on this site until more can be added, and that’s something KRL board members and Kitsap County officials will have to address if they proceed with building a new library on site. Regardless of how you feel about a ballot proposal to annex the Port Orchard Library into the Kitsap County Rural Library District, you could play a role in crafting statements for the voter’s pamphlet about the measure. The city of Port Orchard is seeking city residents to serve on “pro” and “con” committees. Again the proposal is for the Port Orchard Library to officially join the library district. City officials who proposed the ballot measure said joining the district would give citizens the chance to vote in library levy lid lifts, and Kitsap Regional Library is planning to place a levy measure on the November ballot. The library annexation issue, therefore, must be decided in the August primary election. City officials have looked at annexation’s potential effect on property owners’ taxes and have vowed to do what they can keep taxes at the same level if the measure passes. City Clerk Patti Kirkpatrick said that the law outlines the process for drafting the pro and con statements thus: the “pro” committee crafts its statement, then then the “con” committee makes a rebuttal. The city will need to hear from prospective committee members by the end of the business day Monday. If you want to volunteer, or if you need more information, call assistant city clerk Brandi Rinearson at (360) 876-4407.